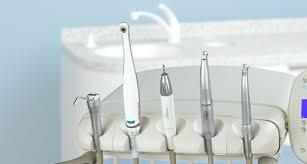 Does the sound of a dental handpiece (you may know it as a “drill”) cause a white-knuckle, cold-sweat reaction in you? Do you avoid going to the dentist, even for routine exams, because you’re afraid a cavity may be found, again bringing to mind the dreaded drill? If so, you’re not alone. Jay Orlikoff, D.D.S., spokesperson for the Academy of General Dentistry, says this reaction is common in many people. “Most of that fear is more psychological than physical,” Dr. Orlikoff said. The whining or buzzing sound of the handpiece, when used to remove decay in a tooth, is loud and, to some people, annoying to the point that it produces stress and anxiety. It is functioning right next to your ear, which greatly exaggerates the sound—and the subsequent psychological reaction—in many patients. Your dentist should thoroughly explain the procedure before you arrive for treatment. Your dentist should also show you the handpiece, turning it on so you can hear the noise it makes. Tell your dentist about your fear and ask if he offers any alternatives for decay removal, such as air abrasion or laser treatment. Ask about receiving nitrous oxide—commonly called “laughing gas”—to relax and calm you before treatment. See if your dentist offers headphones, so you can listen to the radio, a tape, or a CD during treatment. This drowns out much of the handpiece noise. If he doesn’t, see if you can bring your own personal CD or tape player from home. Some dentists offer “i-glasses,” which are like personal movie theaters. They are headpieces that allow you to listen to and watch a movie inside the glasses during dental treatment. Perhaps most importantly, work out a signal system with your dentist—for example, a raised index finger during the procedure means “I feel that!” The dentist should then stop immediately and touch base with you, administering more anesthetic if necessary. Finally, don’t be concerned about your anxiety; it’s a common, completely normal reaction to be anxious, or even fearful, about situations with which you are unfamiliar. Modern dentistry offers a wealth of treatment options to make your visits completely comfortable. It’s far better to catch and restore decayed areas while they’re still small and in the enamel layer of the tooth. Once they’re in the softer dentin layer, they really grow quickly. If they make it to the pulp chamber, we have a whole new set of problems and a different treatment to discuss—root canal therapy.It’s far better to catch and restore decayed areas while they’re still small and in the enamel layer of the tooth. Once they’re in the softer dentin layer, they really grow quickly. If they make it to the pulp chamber, we have a whole new set of problems and a different treatment to discuss—root canal therapy.